These Thigh High Circulation Socks by Truform deliver one of the firmest compression ranges available to improve your leg health with maximum therapeutic effect. Their 30-40mmHg of pressure is rated to alleviate the more advanced symptoms of inadequate leg circulation. Such symptoms can include moderate to severe swelling, unrelenting leg pain and the development of unsightly varicose veins. 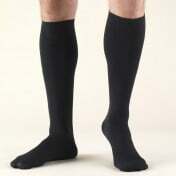 In addition to treating chronic venous insufficiency (CVI) and deep vein thrombosis (DVT), these Medical Support Hose are also recommended for patients recovering from venous procedures. Truform Classic Medical Compression Socks are made from a stretchable, non-constricting nylon and spandex material which is sure to last. The fabric feels great on the skin and provides an accurate fit that feels tailored to you. The classic styling of the stockings give them a look similar to non-medical socks, and their opaque color discreetly conceals scars, spider veins, discoloration, and other visible signs of insufficient leg circulation.They include a soft top band at the top of the socks that gently holds them in place throughout the day. An open toe feature allows for convenient inspection of circulation by healthcare workers without having to remove them. These stockings are ideal for daily wear, when traveling and for anyone who spends long periods of time sitting or standing. Whatever your reason for needing them, soothing, supportive relief from your symptoms can be on the way to you today.